Title text: [After setting your car on fire] Listen, your car's temperature has changed before. 4.3 Interesting Ways to Look at it. This comic is a timeline on how the temperature has changed from 20,000 BCE (Before Common Era) to the present day (2016), with three predictions for the rest of the 21st century depending on what actions are taken (or not taken) to stop CO₂ emission. This comic is a direct, but much more thorough, follow up on the previous global warming comic: 1379: 4.5 Degrees. By having readers scroll through millennia of slow-paced natural changes, Randall uses the comic to confront the the rapid temperature rise in the recent years. Over the past 100 years, human action has produced a large amount of CO₂ emissions, which have caused a rise in average global temperature through the greenhouse effect. 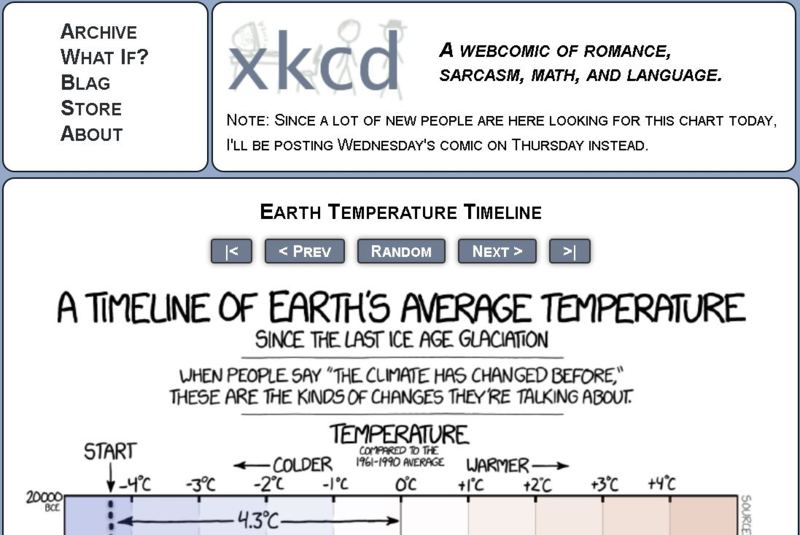 This is called global warming and is part of a climate change, a subject that has become a recurrent subject on xkcd. There are still many people who claim that this is not happening, or at least that it is not caused by any human actions, called climate change deniers. One argument of theirs is that global warming is happening for natural causes, summarized with the phrase "temperature has changed before". This comic shows that while temperature changes have indeed occurred before, the speed of the current temperature rise is much, much faster than those measured for many previous thousands of years. The comic became so popular that Randall postponed the release of his next comic to keep this one on the front page one day longer. The temperature curve is a dotted line most of the time, but from about 1850 to 2016 the measurement data is good enough to let the curve become a solid line indicating that this is not an estimate. Before 1850 the temperature is an estimate based on the sources given. And likewise into the future the three possible curves are also dotted to show that they are predictions, based on how seriously the population of Earth takes knowledge (and comics) like this. Although this is a topic Randall obviously takes very seriously, and by far most of the facts fit with known history, he still includes several jokes in the comic. See also the table explaining each item in the comic. So after the election of a climate change denier later in the year of this comic's release, several sad comics have been posted. Some of the reason could be that Randall no longer believes that even his worst fears (as expressed by the current path at the bottom) will hold up, when USA gets a president, who will on purpose act in a way that scientist claims will make the temperature rise even more. See more here. The title text compares the saying that "the temperature has changed before" comparing temperature changes over thousands of years to the rapid global warming over the last century with saying that the "small" changes to the temperature a car experiences over the years of normal usage should not make you worried over the rapid temperature increase that happens when someone sets your car on fire. A related joke was used recently in 1693: Oxidation. By placing the invention of the internet at 1980 in the chart, just where the temperature curve starts its most rapid increase, Randall humorously implies that the internet caused the rise in temperature. At 13600 BCE a glacier is shown retreating from New York because of the warm up. It is disgusted by the new changes and proclaims: That’s it! I’m moving to Canada! A joke on the typical saying by US citizens that are unhappy with changes in their country, as a kind of protest. According to the chart the glacier first retreated over the Canadian border around 8400 BCE more than 5000 years later. The glacier would be unable to protest at that time, as the United States were founded more than 9000 years later, and hadn't existed at that time. The Pokémon reference at 9000 BCE about them going extinct in North America (although Megan does proclaim that this is not a real fact). As the writing stated that Pokémon go extinct this can also be seen as a reference to a popular video game called Pokémon Go and hence also the recent comic 1705: Pokémon Go. At 4500 BCE, next to "Proto-Indo-European language develops", Ponytail gets the idea to develop the language heavily inflected to make it difficult to remember all the verb endings for future students. A direct reference to the recent comic 1709: Inflection. The reference to the 1984 mockumentary about the fake rock band This Is Spinal Tap in conjunction with Stonehenge at 2200 BCE. In the movie the band ordered a giant 18 feet Stonehenge megalith but a writing mistake gives them one that is only 18 inches high. Another real band Nine Inch Nails is referenced 16000 BCE where Megan writes the bands stylized name NIИ on the wall next to Hairy who is in the process of painting the cave painting at Lascaux in France. Around the setting of the Iliad and the Odyssey (1200 BCE) a drawing of the Trojan Horse has writing on it that states: Not a trap. Just below the previous entry also at 1200 BCE is the mentioning of the invasion of the Sea Peoples. This sounds so much like a reference to mermaids, often called sea people that Randall feels the need to note that this invasion and these sea people is a real thing in a footnote. This is opposed to the Pokémon reference above where he notes that it is not a real fact. The sea people was a seafaring confederation of groups known to have attacked ancient Egypt and other Bronze age civilizations around this time. It is widely regarded to be one of the major causes of the Bronze Age Collapse. At 450 BCE a reference to the Battle of Thermopylae (also known as 300 Spartans) he references this by comparing the event with the 2007 movie 300 about this battle. But notes that in the real world the fighting of course occurred at regular speed and that they probably had more clothing on in the real world than in the fictionalized action movie. There are other minor jokes but this list mentions all the major jokes. Here is table including all elements in the chart with explanations including reading off temperature and year for each event from the curve. The year group is just an easy way to find the section. Element is a description mainly taken from the transcript. The actual year of an event has been read off more precisely on the chart. The central part of the element has mainly been used. Only rarely has ranges below 100 years been used but if a location is clearly midway between two hundred years intervals 50 year range has been used. Only when there are several posts close to each other has smaller range been used a few times. T (°C) is the number of degrees Celsius above or below the 1961-1990 average, which on this graph is set to zero, (i.e. not the number of physical degrees above or below this 0°C). 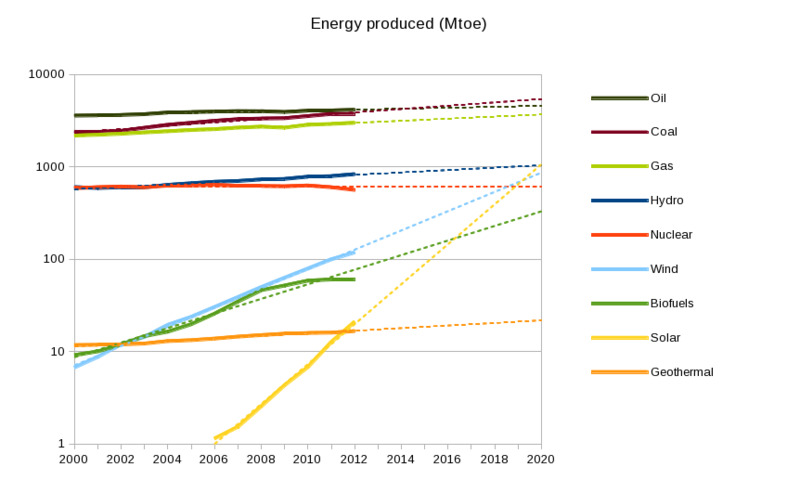 These have been read of to 0.1°C rounding up or down. Lines have been inserted over the chart, 10 for each degree, to make this as accurate as possible. At the start of our timeline, 22,000 years ago, Earth is 4°C colder than during the late 20th century. 20000 BCE -4.3 The scale here is relative, showing the magnitude of change rather than an absolute temperature reading. As a rule, climate changes are compared with a 30 year interval, and recently the 1961-1990 average was chosen for convenience as the "normal" to compare temperature changes with, but any other choice of baseline would show the exact same changes. The Last glacial period (aka ice age) reached its maximum extent approximately 22 to 24 thousand years ago. Boston is buried under almost a mile of ice, and the glaciers reach as far south as New York City. [The Statue of Liberty is shown in front of a glacier front. A guy with a white knit cap is seen walking in a snowy landscape. The skyline of Boston is shown under a half a mile of ice.] 19700 BCE -4.3 This shows what a difference 4 degree in global temperature means (massive effect), as opposed to four degrees on a daily weather wise scale (trivial). The Boston image is directly taken from 1225: Ice Sheets about the ice age glacier coverage; it was also shown buried in ice in 1379: 4.5 Degrees. The guy with the white knit cap could be the guy from 1321: Cold also about global warming. Knit caps have only been used a few times in xkcd, most prominently on Knit Cap Girl in 1350: Lorenz. 19500 BCE But the world is about to warm up. 19500 BCE -4.3 The warming process actually takes thousands of years, which this comic will portray down thousands of pixels to come. This is not a fast warm up, especially not compared to the one we are currently experiencing (at the bottom of the chart). By this time, humans have already spread across Africa, Eurasia, and Australia. 19300 BCE -4.3 Homo Sapiens successfully migrated out of Africa somewhere between 130,000 and 70,000 BCE. They’ve created painting, pottery, rope, and bows and arrows, but haven’t developed writing or farming. 19100 BCE -4.3 The oldest known paintings date back to about 38,000 BCE. The oldest known pottery date back to about 20,000 BCE. The oldest known rope date back to about 26,000 BCE. The oldest known arrows date back to about 70,000 BCE, but Randall seems to be mistaken about the bows which seems to be at most 10,000 years old. Writing is mentioned again at 3500 BCE and farming at 10,000 BCE. 19000 BCE Changes in the Earth’s orbit mean that more sunlight reaches the polar ice… 18600 BCE -4.2 Milankovitch cycles are repeated climate variations on a timescale of tens of millennia caused by cyclic variations in eccentricity, axial tilt, and precession of the Earth's orbit, which thus then determined climatic patterns on Earth. The Milankovitch cycles are referenced again around 4700 BCE. [A line chart with a labeled Y-axis "Summer sun W/m2 at 60°N" with three labeled ticks ranging from 450-550. The curve starts up and then goes down five times and up four times ending down. There is one plateau towards the end compared to the rest of the curve where the ups and downs are quite alike.] 18600 BCE -4.2 The chart shows the input of sun during summer time in the Northern hemisphere (at 60° northern latitude) as the effect (W) per square meter (m2) which fluctuated in the range from 450-550 during the time shown in the chart. There is, however, no scale for the time between the peaks. This chart relates to the text about increasing sun to the polar ice in the entry above. 18500 BCE [A map of the world. At the top is a light gray area covering North America, Greenland and northern Europe and most of the northern part of Russia. A similar gray area covers Antarctica. The gray areas are labeled as ice.] 18300 BCE -4.2 This map shows where the ice covered the northern hemisphere (and Antarctica) during the Last Glacial Maximum. The continents have not moved much since then, but the lower water level caused by the amount of water bound up in the ice, can clearly be seen in several locations. For instance, the British islands, Greenland, and Papua New Guinea are connected to their respective neighboring continents. Also Alaska and Russia are connected through the ice sheets covering the northern part of the Earth. 18000 BCE …And the ice sheets start to melt. 17900 BCE -4.1 This was a slow process that takes 10,000 years. The ice is mentioned again at 13,600 and 8400 BCE. 17500 BCE Temperatures have been creeping upward, but around this point, CO2 levels start to climb… 17300 BCE -4.1 Due to the release of gasses from various sources (dissolved in the ocean, trapped in permafrost, etc), atmospheric CO2 levels increased by 100 parts per million over a span of thousands of years. Modern civilization has added the same amount in a single century. 17000 BCE …And then the warming speeds up. 16700 BCE -4.1 It took 3000 years for the temperature to increase with one degree. So this sentence can be seen as sarcasm about the rate of natural climate change compared to modern anthropogenic (human caused) warming. Cueball: Still pretty cold. 16200 BCE -4.0 True, because although the temperature has risen with 0.3°C over the last 4000 years, it's still 4°C below the 1961-1990 average. 16000 BCE [Megan touches the dotted line to the right of her, with Ponytail standing on the other side. The graph has finally passed the -4°C line below the 1961-1990 average.] 15600 BCE -3.9 Megan is the first drawing on the left side of the curve. She seems to be pushing the temperature up. Short warming or cooling spikes might be “smoothed out” by these reconstructions but only if they’re small or brief enough. Reconstructions are from Shakun (2012) and Marcott (2013), scaled to Annan + Hargreaves (2013) estimate for the last glacial period. 15600 BCE -3.9 This is Randall's pre-emptive response to skepticism about the accuracy of prehistoric data. Ice cores and similar records might miss individual year-to-year variation, but should catch sustained changes lasting many decades, which is the time scale that matters for climate. See links to the sources below. [Hairy paints three animals, two with horns, and two humans, Cueball holding hand with Hairy who has a spear. On the other side of the central line Megan writes three letters, the last of which is reversed:] NIИ 15200 BCE -3.8 A reference to the industrial techno band Nine Inch Nails as Megan writes the bands stylized name NIИ on the wall next to Hairy who is in the process of painting part of the cave paintings at Lascaux in France. [From around the bottom if this section and down to 11500 BCE the dotted curve moved steadily to the right towards warmed temperature peaking close to 1.5°C below the 1961-1990 average. Before this the temperature had not moved much away from that at the start.] 14600 BCE -3.5 This land bridge is known as Beringia. It is mentioned again at 8300 when it disappears due to the rising seas. Humans reach North America. 14200 BCE -3.3 This is approximately when the humans from Asia crossed the land bridge mentioned in the previous entry, from what is now Siberia to what is now Alaska. Settlement of the Americas occurred around the time shown in the chart, although it's possible that earlier humans did so by boat prior to the formation of the land bridge. Cueball's comment is a double entendre; it was figuratively "cool" that early people migrated this far, and the climate was literally cool compared to modern times. 14000 BCE The edge of the ice withdraws from New York City and retreats north. 13700 BCE -3.1 Even though the ice began to melt 4000 years before (at 18,000 BCE in the chart) it is first now that New York City is free of ice. Glacier: That’s it! I’m moving to Canada! 13600 BCE -3.0 When US citizens are unhappy with changes in their country, they sometimes say they will move to Canada in protest. Here it is the glacier that is anthropomorphically unhappy with the climate changes. However this is a slow process; it crosses the Canadian border more than 5000 years later. (Date uncertain, may be much earlier) 13400 BCE -3.0 See Origin of the domestic dog. This timeline event is not quite accurate. The first dogs differentiated from wolves about 23,500 years ago, but there was an event around 13500 BCE that increased the population size and may be attributable to domestication events. Megan: Okay, you can live in our homes and we’ll feed you, but we’ll still get mad if you poop on the floor. Cueball: And we get to breed you to be tiny and dress you in little costumes. 13000 BCE Woolly Rhino goes extinct 12900 BCE -2.7 Mainland woolly rhinos died in the Quaternary extinction event, but a small island population survived until around 8000 BCE. Woolly rhinos likely became extinct in part due to over-hunting. Randall's choice of species on this chart seems to focus on animals that were greatly affected by humans, for good or ill.
Oregon is scoured by huge floods as glacial dams burst and lakes of meltwater flow to the sea 12600 BCE -2.2 This is a reference to the Missoula Floods several cataclysmic floods that swept periodically across eastern Washington and down the Columbia River Gorge flooding much of eastern Washington and the Willamette Valley in western Oregon at the end of the last ice age. During the last deglaciation ice dams formed then burst several times between 13,000 and 11,000 BCE. 12500 BCE Ice sheets withdraw from Chicago 12200 BCE -1.8 The next step towards the Canadian border, after they left New York at 13,600 BCE. 12000 BCE Humans settle Abu Hureyra in Syria 11550 BCE -1.6 A well-preserved prehistoric village that existed from 11,000 to 7000 BCE (a little later than noted in the chart), allowing archaeologists to study how their culture developed. This may be caused by changes in ocean circulation due to the floods of cold fresh meltwater flowing into the Atlantic as the North American ice sheet melts. This cooler period is called the Younger Dryas 11300 BCE -1.6 In the Younger Dryas, the Earth cooled by almost one degree over 1000 years. There were several floods during the end of the ice age but the most famous is the one from Lake Agassiz. A similar but less global effect could occur if the ice on Greenland melts too quickly and causes a shutdown of thermohaline circulation. Without the Gulf Stream, hot water would remain in the Gulf of Mexico and the Caribbean instead of warming the North Atlantic and Europe. The movie The Day After Tomorrow dramatized a worse-than-worst-case version of this, happening in days instead of centuries. Humans reach Argentina 10900 BCE -1.8 The earliest evidence of humans in Argentina. Finally the temperature graph has risen enough that there is space to write text on the left side of the curve. Warming resumes 10500 BCE -1.8 After 1000 years of slightly decreasing temperatures the warm up of Earth resumes. Over the next 3000 years the temperature increases 2.5°C, reaching a long plateau about 0.5°C above the 1961-1990 average around 7500 BCE. Human settlements at Jericho 10050 BCE -1.4 The first permanent settlement on the site of Jericho occurred around 9500 BCE, but there is evidence of non permanent settlement during this period, when cold and drought made permanent habitation in that region difficult. 10000 BCE First development of farming 9750 BCE -1.1 This is now called the Neolithic Revolution, i.e. the wide-scale transition of many human cultures from a lifestyle of hunting and gathering to one of agriculture and settlement. The history of agriculture began independently in several locations with both domestication of animals and the farming of different cereals. One of the first regions to develop farming was the Fertile Crescent. This is also around this time that the last ice age is said to have ended. 9500 BCE Saber-toothed cat goes extinct 9200 BCE -0.3 Although one of these (Smilodon) was known as the saber-toothed tiger, most saber-toothed "cats" are not related to tigers, or any modern cats at all, but can be viewed as examples of convergent evolution. Smilodon became extinct around 8000 BCE, and the last Saber-toothed cat first became extinct around 7000 BCE, which does not fit very well with Randall's range. Indirectly humans may have caused the extinction of the Saber-toothed cat by over-hunting their megafauna prey, depriving the cats of food sources. Horses disappear from North America 9100 BCE -0.2 The evolution of the horse began millions of years ago in North America; early species migrated across Beringia into Eurasia before their predecessors died out. Megan: That is not a real fact. 8900 BCE -0.1 Pokemon are not real. This faux-extinction is likely a reference to the recent Pokémon Go game, which Randall spoofed in 1705: Pokémon Go. Virtual Pokémon now thrive throughout the entire world, and are most commonly found near affluent first world neighborhoods. Temperatures reach modern levels 8800 BCE 0.0 It took 11,200 years for the temperature to increase 4.3°C. It's possible that human-created effects will produce an equal change in a few hundred years. Rising seas cut off the land bridge between North America and Asia 8700 BCE 0.1 Beringia was freed of ice in 15,000 BCE. This is an example of what happens when the temperature rises and glaciers melt. Sea levels are rising again as ice on Greenland and Antarctica continues to melt. Cattle domesticated 8500 BCE 0.2 Cattle feature prominently in the comic 1338: Land Mammals. Temperatures start to level out slightly above 1961-1990 levels 8050 BCE 0.4 The next 3000 years the temperature stays within 0.2°C degree of a temperature 0.5°C above the 1961-1990 average. A very long and stable period. 8000 BCE [The above sentence breaks over the 8000 BCE line. From here a maximum in temperature on the chart is reached at 0.5°C above the 1961-1990 average, which will not be overtaken until 2000 CE. It stays almost constant here until 5000 BCE where a slight cooling begins.] 8000 BCE 0.4 This is the only five hundred year span with no events listed fully inside. Maybe because nothing happens with the temperature. 7500 BCE This warm, stable period is called the Holocene Climate Optimum 7400 BCE 0.5 Some skeptics like to say "it was warmer in the Holocene." This is no longer true. Global temperature began encroaching Holocene levels in 1998, and has equaled or possibly exceeded them since 2014. Jiahu settled in China 7050 BCE 0.5 Jiahu is another prehistoric settlement, similar to Abu Hureyra (12000 BCE), that was extensively studied by archaeologists. 7000 BCE Final collapse of the North American ice sheet leads to rapid 2-4m sea level rise… 6800 BCE 0.55 The temperature almost reached 0.6°C above the 1961-1990 average before this happened and caused the slight decrease in temperature mentioned below. …And a period of cooling in the Northern hemisphere 6550 BCE 0.5 A 0.05 degree decrease in 200 years again refers to the theme of slow natural climate change. 6500 BCE As seas rise to near their modern levels, Britain is cut off from mainland Europe 6300 BCE 0.45 This is a reference to the flooding of Doggerland. 6000 BCE Humans develop copper metalworking 5600 BCE 0.5 The copper age was relatively brief before humans discovered how to make bronze. 5500 BCE Massive volcanic eruption in Oregon creates crater lake 5300 BCE 0.55 Crater Lake is the caldera at the top of Mount Mazama, a collapsed stratovolcano. If it erupted again, it could become a Somma volcano (see 1714: Volcano Types). Gold metalworking 5050 BCE 0.6 The temperature peaks here at just a bit more than 0.6°C above the 1961-1990 average. It will not rise above this level until the global warming sets in in the 1900s. 5000 BCE Invention of the wheel 4900 BCE 0.6 Wheels are one of the most important inventions of humanity. They feature in many xkcd comics, such as 1075: Warning. Earth begins to cool slowly mainly due to regular cycles in its orbit 4800 BCE 0.5 Again a reference to the Milankovitch cycles mentioned in detail at 18,600 BCE. Here they cause a cooling rather than a heating as they did back then. 4500 BCE Proto-Indo-European language develops 4400 BCE 0.5 Most of the languages in Europe, the Middle East, and India share a surprising number of common roots. PIE is the theoretical ancestor from which they descend. Randall mentions this language family in many comics, such as 890: Etymology. Ponytail: Let’s make our language heavily inflected, so future students have to memorize a zillion verb endings! Cueball: Okay! 4400 BCE 0.5 Ponytail gets the idea to develop the language heavily inflected to make it difficult to remember all the verb endings for future students and Cueball is okay with that. This is a direct reference to the recent comic 1709: Inflection. Permanent settlements in the fertile crescent 4200 BCE 0.5 The Fertile Crescent is one of those things you're supposed to remember from grade school. A lot of historic milestones happened there, such as the pyramids of Giza, the code of Hammurabi, and the Abrahamic religions. 4000 BCE Horses domesticated 3950 BCE 0.5 Horse riding was the greatest advance in land travel until the invention of engines. 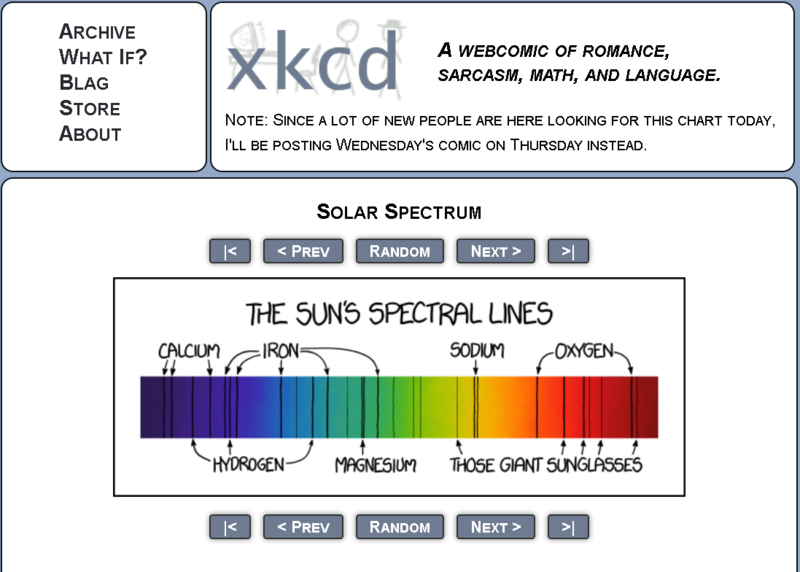 Horses appear in many xkcd comics, such as 936: Password Strength. Minoan culture arises on Crete 3700 BCE 0.5 Minoan culture invented many strange and wonderful things, such as the Labyrinth at Knossos and Bull-leaping. 3500 BCE Egyptian mummification 3500 BCE 0.5 xkcd has discussed mummification in What If? 134: Space Burial. Rise of the Indus Valley civilization 3300 BCE 0.5 The largest bronze-age civilization. Earliest human whose name we know (Pharaoh Iry-Hor in Egypt) 3100 BCE 0.5 The first named person we know of today! This was also mentioned as a "cool fact" in the title text of 1355: Airplane Message. 3000 BCE Three Sovereigns and Five Emperors period in China 2800 BCE 0.4 The temperature has finally dropped below 0.5°C above the 1961-1990 average after almost 2000 years of cooling from 0.6°C above the 1961-1990 average. Gilgamesh 2700 BCE 0.4 Gilgamesh was probably a Sumerian king whose tales were exaggerated into mythology. Imhotep 2600 BCE 0.4 Imhotep was not a pharaoh, but a wise commoner who was elevated to chancellor, high priest, and post-mortem divinity. Mayan culture emerges 2600 BCE 0.4 Like the ancient Egyptians, Mayans are remembered for pyramids and logographs. Great Pyramid constructed 2650 BCE 0.4 xkcd has discussed pyramids in 1717: Pyramid Honey and What If? 95: Pryamid Energy. 2500 BCE Corded Ware culture in Europe 2500 BCE 0.3 The term Corded Ware was invented by an archaeologist; no civilization actually called themselves that. Stonehenge completed 2200 0.3 This is a reference to the 1984 mockumentary about the fake rock band This Is Spinal Tap. In the movie the band wanted a giant Stonehenge prop 18 feet high, but a writing mistake gives them one that is only 18 inches. Chariots developed 2000 BCE 0.3 But Chariots of Fire came much later. 2000 BCE Alphabetic writing developed in Egypt 1750 BCE 0.2 Obligatory reference to xkcd 1069: Alphabet. Last mammoths on a tiny Siberian island go extinct 1650 BCE 0.2 Many of the Pleistocene megafauna died in the Quaternary extinction event. Like the woolly rhino (see 12900 BCE) these animals likely became extinct in part due to humans hunting them, which may be why Randall included them in the chart. Most of the mammoths died out before 8000 BCE but some survived in remote areas and the last known population died on Wrangel Island in the Arctic Ocean around 2000 BCE, slightly earlier than Randall shows here. Minoan eruption 1600 BCE 0.2 This volcano may have led to the downfall of Minoan civilization. 1500 BCE Iron smelting 1400 BCE 0.1 The beginning of the Iron Age. Olmec civilization develops in Central America 1350 BCE 0.1 No, Maggie, not Aztec, Olmec. Text on horse: Not a trap 1250 BCE 0.1 A reference to the Trojan War qua the drawing of the Trojan Horse. The horse was a big trap letting the soldiers hidden inside it into Troy. This explains why it has Not a trap written on it. Else they would not have taken the giant wooden horse present from their sworn enemies into their city just like that... Note that the Trojan horse isn't mentioned in the Iliad, and only recalled in passing by the characters in the Odyssey. * A real thing 1200 BCE 0.1 Sea people might sound like a reference to mythical mermaids, so Randall feels the need to footnote that this event was a real thing (as opposed to his Pokémon reference, which he notes is not a real fact). The sea peoples were a seafaring confederation of groups known to have attacked ancient Egypt around this time. Polynesians explore the Pacific Ocean 1000 BCE 0.1 Polynesian navigation was surprisingly widespread. 1000 BCE [From 1000 BBC to 1000 CE the temperature is stable and very close to the 1961-1990 average.] 1000 BCE 0.1 The temperature has fallen from the Holocene Optimum by half a degree to just a bit above the the 1961-1990 average. It will stay in this range for the next 2000 years. Solomon 1000 BCE 0.1 Solomon may have been a real historical king, but he probably did not threaten to chop a baby in half. Iliad and Odyssey composed 900 BCE 0.1 These classic myths were written more than 300 years after their supposed events. Archaeologists believe the city of Troy existed (and was destroyed by war around the right time period), but characters like Helen, Odysseus, and Achilles did not. Rise of Greek city-states 800 BCE 0.1 This is Sparta, along with Athens and several others. Neo-Assyrian Empire 800 BCE 0.1 Hi, you may remember us from such kings as Adad-nirari and Sennacherib. First Olympics 750 BCE 0.1 The first of the ancient Olympic Games is traditionally dated to 776 BC. Zapotec writing in modern Mexico 600 BCE 0.0 Another Central American culture that fell to the Spanish invasion. Confucius 550 BCE 0.0 "He who knows all the answers has not been asked all the questions." 500 BCE The stuff in the movie 300, but regular speed and with more clothing 450 BCE 0.0 A reference to the Battle of Thermopylae by comparison with the 2007 movie 300 about this battle. The real Spartans wore armor, and real humans don't fly through the air in slow motion when struck. Buddha 450 BCE 0.0 Randall also mentions other religious figures like Jesus and Muhammad. Nazca Lines 350 BCE 0.0 These huge ancient drawings are difficult to see from ground level, leading some people to believe that they were intended for aliens. Alexander the Great 350 BCE 0.0 One of the most successful conquerors of the iron age, known for supposedly cutting the Gordian Knot. Mayan hieroglyphics 250 BCE 0.0 The Maya Calendar was probably created hundreds of years later. Ashoka the Great 250 BCE 0.0 The Edicts of Ashoka proselytized Buddhism across the continent. Paper invented 200 BCE 0.0 A significant step up from stone tablets or even papyrus. Asterix 100 BCE 0.0 Fictional main character in The Adventures of Asterix, a comic series set around 50 BCE when Julius Caesar conquered Gaul. Teotihuacán metropolis 100 BCE 0.0 Another ancient city much beloved by archaeologists, even though they don't know who built it. Julius Caesar 50 BCE 0.0 Aside from being a conqueror, dictator, and deity, Julius had a big impact on calendars. The month of Quintilis was renamed July to honor him, and he was famously assassinated on the ides (middle day) of March. 1 CE [Instead of a zero, there are two numbers for each of the two scales before (1 BCE) and after Christ (1 CE)] 0 CE -0.1 Originally the year range went directly from 1 BC to 1 AD. The year zero has since been added for ease of mathematical and astronomical calculations. Roman Empire 1 CE -0.1 Julius never held the title "Emperor"; his adoptive son Augustus was the first to do so. Jesus 1 CE -0.1 Randall also mentions other religious figures like Buddha and Muhammad. Pompeii 100 CE -0.1 The volcano is Mount Vesuvius which exploded in 79 CE and is famous for burying everyone in the close by city Pompeii preserving peoples bodies inside the huge amount of ash that swallowed the city very rapidly. Today it has given the archeologist lots of knowledge about the culture of that time. Three Kingdoms period 250 CE -0.1 Not just a series of movies and video games, but an actual thing that happened in China. Gupta empire 700 CE -0.1 Not as great as Ashoka, but still a pretty important time in the history of India. Various groups take turns sacking Rome 550 CE -0.1 500 years is a pretty successful span for an empire. Attila the Hun 550 CE -0.1 He probably would not mind being remembered as one of the most infamous barbarians in history. Tang Dynasty 750 CE 0.0 A golden age in China, responsible for the development of printing, gunpowder, and many other advances. Medieval warm period in Europe and some northern regions (too regional to affect the global average much) 900 CE 0.0 Changes in ocean currents caused various regions to warm up while others cooled. Leif Eriksson 950 CE 0.0 Probably the first European explorer to reach North America. Magnetic compass navigation 1050 CE 0.0 It's much easier to sail to the Orient when you can orient yourself. [The dotted curve moves to the left towards lower temperature reaching a minimum around 1650 CE of about 0.6°C below the 1961-1990 average at the Little Ice Age.] 1150 CE -0.1 This less than half a degree drop in temperature over 500 years was enough to cause the "Little Ice Age" which resulted in extended ice coverage in the winters in instance Europe. See more below at the entry for the Little Ice Age. Ghengis Khan 1200 CE -0.2 Mongol emperor. Gengar is not named after him, but Kangaskhan and the Khals are. Zheng He’s fleet explores Asia and Africa 1400 CE -0.3 He explored farther than European contemporaries like Dias or de Gama. Aztec Alliance 1400 CE -0.3 Aztec dominance only lasted a century until Cortes arrived, but their cultural legacy is indisputable. Printing press 1450 CE -0.3 Johannes Gutenburg ushered in the Age of Enlightenment. Columbus 1490 CE -0.3 The time given here references when Christopher Columbus reached the New World in 1492. The five events around 1500 CE lies very close together but it fits with Columbus fitted in just before 1500. 1500 CE European Renaissance 1500 CE -0.3 From here on, the chart has labels for each 100 year increment instead of 500, but the scale stays the same. Important events happens so much faster in these last five hundred years, there isn't enough space to write all of them, so Randall has had to be selective. He includes Isaac Newton but leaves out Albert Einstein, includes airplanes but leaves out cars, etc. Shakespeare 1600 CE -0.4 xkcd references Shakespeare many times, such as 79: Iambic Pentameter and 1026: Compare and Contrast. 1600 Newton 1650 CE -0.4 Isaac Newton appears in various xkcd comics, such as 626: Newton and Leibniz. ”Little Ice Age” 1650 CE -0.4 This was not a true geologic Ice Age, just a slightly chilly period when the temperature fell a fraction of a degree, but still colder than it had been through 11,000 years of human civilization. In Europe the winters were so cold that the river Thames froze over hard enough to hold River Thames frost fairs between 1607 and 1814. And in 1658 Sweden crossed the Danish Straits on foot to invade Copenhagen in the March Across the Belts. It was only possible due to the harsh winters of the Little Ice Age, demonstrating how much half a degree of climate change can mean. 1700 Steam engines 1750 CE -0.4 The Age of Steam heralded the upsurge of human CO2 emissions. Unites States Independence 1770 CE -0.3 On July 4, 1776. 1800 Industrial Revolution 1825 CE -0.3 Not to be confused with Industrial music such as Nine Inch Nails. Telegraphs 1830 CE -0.3 -. --- .-- --..-- / - .... . / -- --- - .... . .-. / --- ..-. / ... .- -- ..- . .-.. / -- --- .-. ... . / .- .-.. .-- .- -.-- ... / ... . -. - / - .... . / .-.. .- -.. / --- ..- - / --- -. / .- / .... --- .-. ... .
[After this the dotted curve becomes solid.] 1850 CE -0.3 From 1850 weather records became sufficiently accurate and widespread to greatly improve the precision of climate measurements. Hence the curve stops being an estimate and thus also stops being a dotted curve and becomes solid. 1900 Airplanes 1900 CE -0.3 xkcd discusses airplanes many times, such as 726: Seat Selection and 30: Interplanetary Cessna. World Wars 1930 CE -0.2 Likewise, there are many xkcds on this topic, such as 261: Regarding Mussolini and 100: WWII Films. [The solid line takes a step to the right close to the 1961-1990 average. Over the rest of the 1900s it moves closer to the 1961-1990 average, crossing it before 2000 where it almost reaches the maximum temperature of 0.5 °C above the 1961-1990 average from earlier in 8000 BCE.] 1940 CE -0.2 This is what the previous 14000 pixels of comic has been leading up to. After a laborious 20 millennia of gradual and meandering climate change, it should be clear that a full degree of warming in a single century is unprecedented in human history, and very unlikely to be natural variation. Fossil fuel CO2 emissions start rapidly increasing 1950 CE -0.1 The infamous "hockey stick" starts around here. Nuclear weapons 1950 CE -0.1 The Working Group on the 'Anthropocene' suggests dating the Anthropocene epoch from ~1950. The week after this comic 1736: Manhattan Project with a mushroom cloud was released. Internet 1980 CE 0.1 The origin of the internet dates back to 1960 but it began growing rapidly in 1980. By placing the invention of the internet at 1980 in the chart, just where the temperature curve starts its most rapid increase, Randall uses this correlation to humorously imply that the internet caused the rise in temperature. This is also where the temperature crosses the 1961-1990 average, which has to happen somewhere due to the Intermediate Value Theorem. 2000 Northwest Passage opens 2000 CE 0.4 This was dramatic evidence that the climate had changed. When global warming removes enough sea ice to create shipping routes that never existed before, then it is clear to people that something is changing, even if they disregard who/what is responsible for the change. [From here to present day the solid line increases rapidly and in 2016, present day, is almost reaches 1°C above the 1961-1990 average, with about 0.8°C above the 1961-1990 average.] 2016 CE 0.8 Notice: Warming did not stop in 1998. [From here the curve once again becomes dotted as this is the future. After one dot it splits in two and after the first two dots another split between them occurs forming three possible future dotted curves.] 2016 CE 0.8 Here stops the data and the projection into the future begins so the curve again becomes dotted. Three different scenarios are depicted. Optimistic scenario 2100 CE 2.0 If all the current realistic preventions are implemented, which might not be so realistic, then we may not even stop the warming but slow it down so we "only" reach 2°C above the 1961-1990 average in 2100 CE but it would not stop there. This is half the temperature change experienced since the ice age, but the other way. This was directly referenced in the title text of 1379: 4.5 Degrees: That's only HALF an ice age unit (IAU), which is probably no big deal. Current Path 2100 CE 4.2 In this last scary scenario Randall assumes the temperature keeps rising steadily by extrapolating along the slope of the last two to three years. Randall has warned about the hazards of Extrapolating, but this line is in fact below the worst case predictions. If this comes true we will reach a temperature increase taking us from the 1961-1990 average and in just 125 years to 4.2°C above this average. That is just as far above this average in that short time span as the ice age temperature was below. And it took more than 11,000 years for nature to reach such an increase. Randall already contemplated what this would be like in the +1 ice age unit (IAU) panel of 1379: 4.5 Degrees two years ago, as well as in 164: Playing Devil's Advocate to Win almost 10 years ago. He may get to enjoy quite a ride as he "wished" for back then. There is no reason to assume the temperature will not keep rising past 2100 CE, so the "Hothouse Earth" of the early Cretaceous period mentioned in the 4.5 degree comics +2 IAU panel might come to pass in future centuries if we continue on our current path. On the bright side, modern civilization might collapse if this trend keeps up, which would drastically cut our releases of carbon dioxide and other greenhouse gasses into the atmosphere. But then again, positive feedback from methane in melting permafrost might take over... Good luck Earth. Note there are several spelling errors in the comic, so please do only correct spelling errors that are not part of the comic! See more in the trivia section. At the start of our timeline, 22,000 years ago, Earth is 4°C colder than during the late 20th century. But the world is about to warm up. By this time, humans have already spread across Africa, Eurasia, and Australia. They’ve created painting, pottery, rope, and bows and arrows, but haven’t developed writing or farming. …And the ice sheets start to melt. …And then the warming speeds up. Reconstructions are from Shakun (2012) and Marcott (2013), scaled to Annan + Hargreaves (2013) estimate for the last glacial period. The edge of the ice withdraws from New York City and retreats North. Glacier: That’s it! I’m moving to Canada! Megan: Okay, you can live in our homes and we’ll feed you, but we’ll still get mad f you poop on the floor. Megan: That is not a real fact. There have been several large drawings in the history of xkcd, some of which are bigger than this one (for instance 1110: Click and Drag). Among those that can be viewed in one go, without downloading a larger file or moving around, this is by far the longest. The next longest is probably 482: Height. The timeline starts at 20,000 BCE (22,000 years ago) and ends at 2100 CE, thus covering 22,100 years. There are several spelling mistakes. Most obvious is the second time Randall wrote the word "Iliad," because he just spelled it correctly at 1500 BCE and then spelled it Illiad at 1000 BCE with two "L"s.
Attila the Hun becomes Atilla the Hun with one T and two L's. Pokémon is spelled Pokemon, but then again that is not so strange for Randall (see 1647: Diacritics). But he usually spells it correctly as in the recent comic 1705: Pokémon Go. Note that the fact that woolly rhinoceros becomes Wooly rhino with only one l is not a spelling mistake but an alternative spelling of the word. 1850: methodical temperature record begins. However, this fact is indirectly indicated when the temperature curve becomes solid around 1850 and until present day. The entire swing period between 20 and 200 thousand years prior to now would depict temperature swings with increasing frequency and amplitude (ref geological record). But of course, this could not be included in a comic that only goes back to 20,000 BCE. During much of the 300 million years prior to that, the Earth was significantly warmer than now. However, the data's temporal precision decreases with age; seemingly abrupt changes millions of years ago might have happened over centuries or millennia. Hence, the older data is not usable to compare rates of change. This comic became popular with a much broader audience than most xkcd comics. It was discussed admiringly by news sites such as Popular Science, Reason, Slate, Smithsonian, and Forbes. It was promoted by famous individuals such as Elon Musk and John Green, and of course criticized by climate skeptics such as Anthony Watts and Joanne Nova. Due to increased interest, Randall decided to push the release of the next comic 1733: Solar Spectrum one day back for a rare Thursday release instead of the scheduled Wednesday release. I'll be posting Wednesday's comic on Thursday instead. 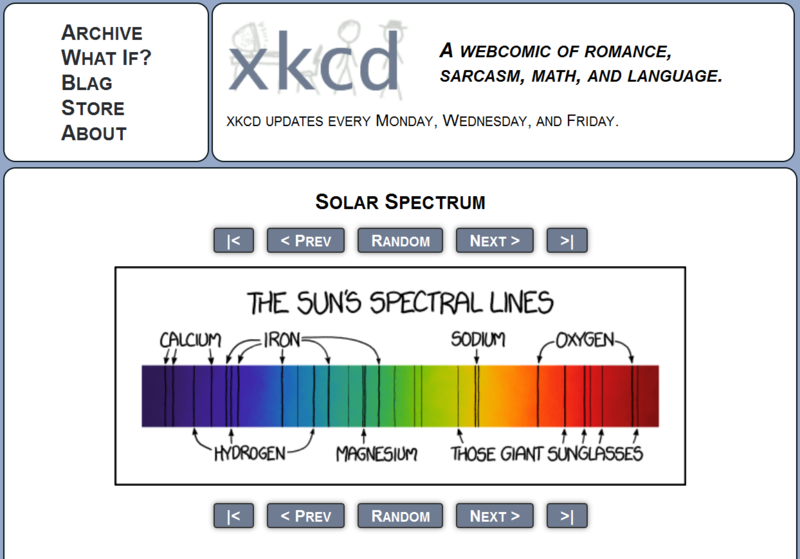 Before that, the normal heading with the release day of xkcd was shown. This was (of course) still there Tuesday the day after the release, because it was first on Wednesday there were reason to note the delay. It stayed in place even for some time after the "Wednesday" comic was released on Thursday, but was then removed before noon (EST) on Thursday. Randall did thus not post a link to this comic in the header text for new visitors to use, only giving them that one extra day. Even though the next comic was released on a Thursday, the scheduled Friday comic 1734: Reductionism was still released as planned. This was also the first time this occurred on xkcd - see this trivia item from the Friday comic. 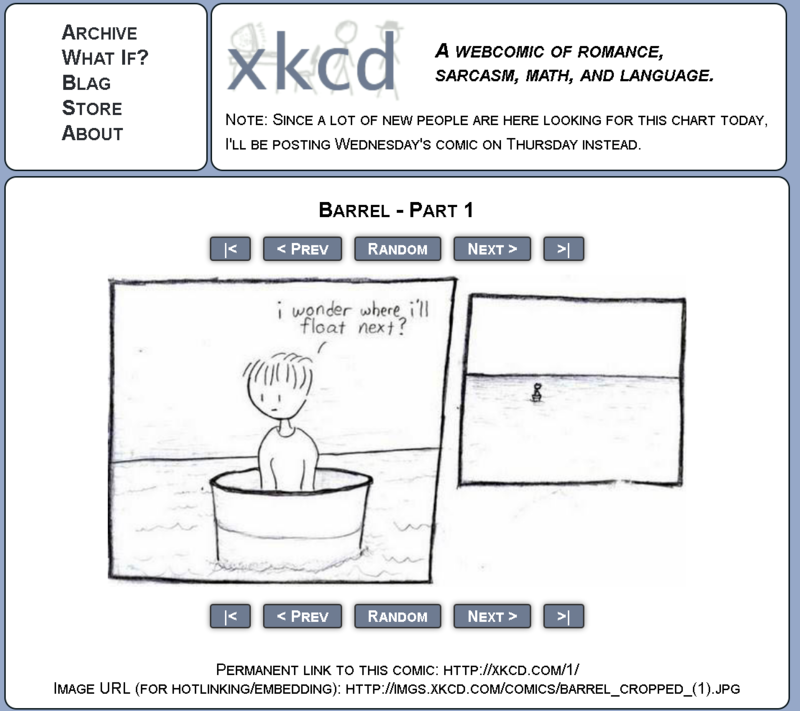 This comic's popularity was possibly the reason that both the more-than-10-year-old xkcd warning as well as the original footnote was removed on the day of this comic's release. The next footnote was added 22 days later. The colors used to represent temperature vary from blue (the perceived hue of a black body at 20000K) to pale red (perceived at 2200K). Very interesting and important work. Actually.... Solomon and Jesus are not historical figures. Outside the Old and the New Testament, there is no archaeological or other evidence for their existence. I suppose, Jesus has played a significant role in history. So, you may be justified to add an entry saying something like "Date that religious traditions hold as the date of birth of Jesus." Then, if you mention, say, Shakespeare, then you should also mention the estimated composition of the Bible, an event with more important historical influences. Roman empire was continued for more than thousand years (Eastern Roman Empire, today reffered as Byzantium). Actual "best-case scenario assuming immediate massive action to limit emissions"
What will it take to get to this scenario? https://www.solveforx.com/explorations/foghorn/ with http://freenights.txu.com/ and http://co2-chemistry.eu/ for ocean carbonate-sourced plastic composite structural lumber allowing reforestation. First, the Guardian is a newspaper, not a science journal. Second, that article is from 2013, before the latest upsurge. Third, even ignoring those things, the article doesn't say what you claim it does. The single most optimistic sentence I see is "If we are lucky, the impact of burning all that oil, coal and gas could turn out to be at the less severe end of the plausible spectrum." The rest of the article is quite pessimistic, such as "it is overwhelmingly likely that we would shoot well past 2C and towards 3C or even 4C of warming." Interesting Ways to Look at it.